I love to travel (I mean, really... don’t we all?). Traveling is one of my favourite things to do, but packing is not. 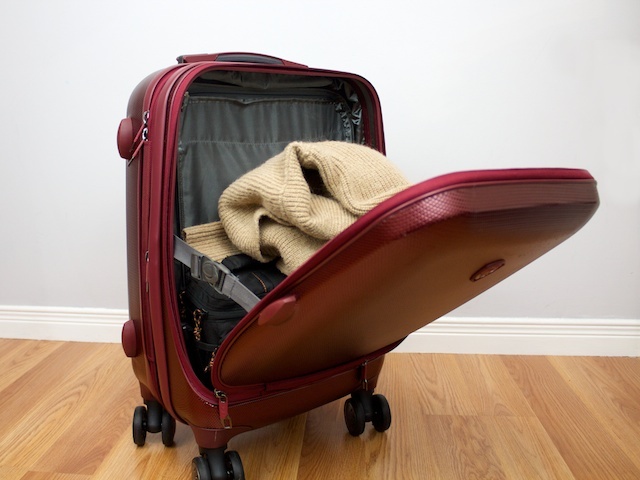 Fortunately, luggage has come a long way and there are new small but intuitive changes that make packing that much easier for me. 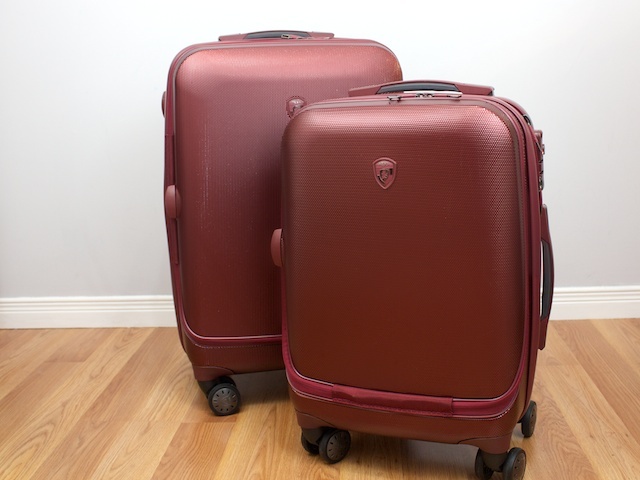 I have a couple big trips planned (and we’re also approaching a busy travel season), so I thought I’d take you along on my packing journey and have a little chat on luggage. 1. 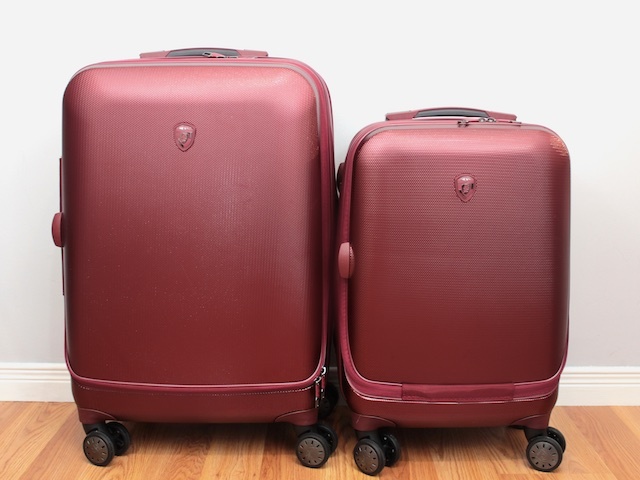 The Material — this is probably the most obvious when you’re choosing between luggage sets. Your choices are typically between nylon, polyester, or polycarbonate. Choosing between the three is essentially choosing between durability (and also aesthetics). I have always gravitated towards polycarbonate because the hard sides do a great job of protecting my stuff. Plus, they’re often really lightweight and look pretty sleek. 2. The Size — bigger isn’t always better when it comes to choosing a size. Be wary of 30” suitcases! Sure you can fit three extra pair of shoes and two extra outfits in there, but it also adds to the weight. 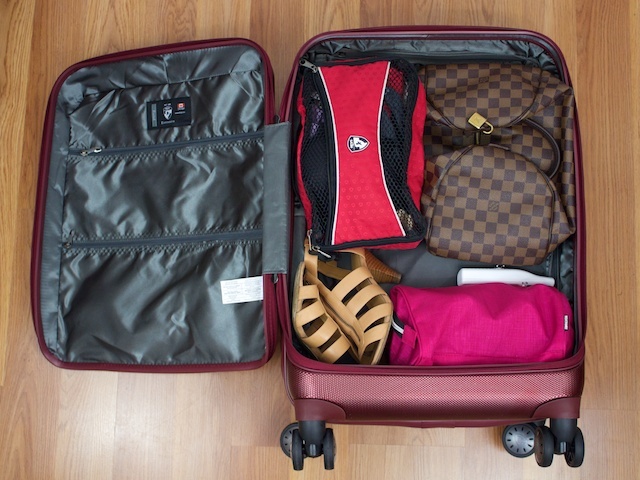 The heavier the suitcase, the more likely you are to pay extra for it. Plus—traveling can sometimes be tiring enough without having to lug around a cumbersome suitcase. 3. 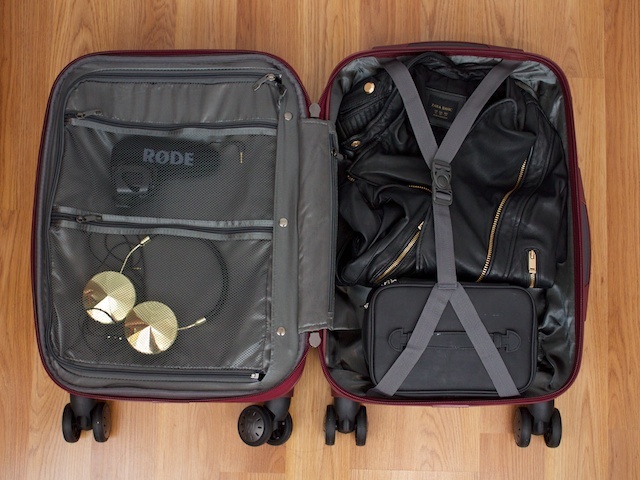 The Wheels — you haven’t traveled until you have traveled with four-wheeled luggage. Having the ability to easily glide luggage beside you rather than pulling it behind you is a simple yet effective luxury. Standing at long customs lines has never been so hassle-free. Plus, if you are in a situation where two-wheeled luggage is a benefit (i.e. Parisian cobbled streets) then you still have that option. 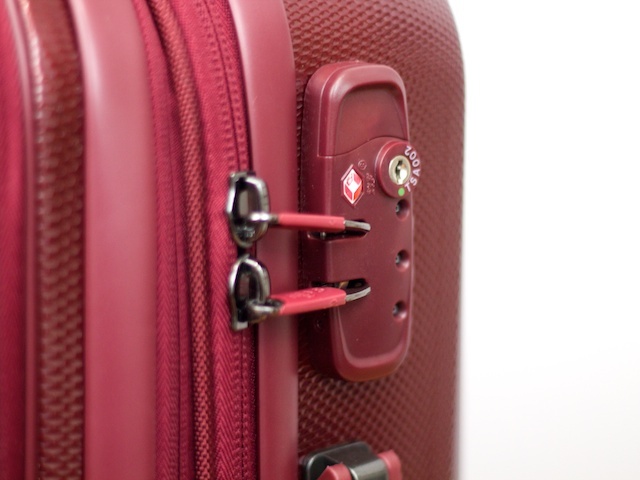 Enter the HEYS Portal SmartLuggage*. Readers beware: I am biased because I’ve always loved traveling with HEYS products (by the way, did you know they’re a Canadian company—founded right out of Toronto?). My favourite thing about this luggage set: compartmentalized packing. Unlike traditional luggage sets that only allow you middle access to the luggage, this Portal SmartLuggage gives you front access, too. 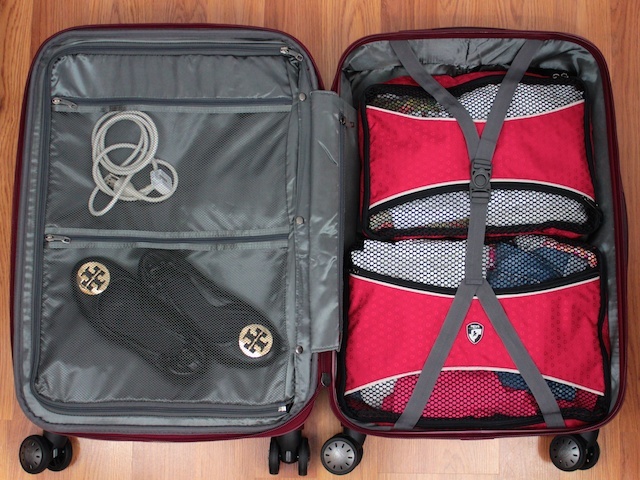 Seems simple enough, but this design makes packing and accessing your stuff much easier. While my extra purse, extra pair of shoes, undergarments, toiletries and luggage scale take up the top half of space. I love the mesh pockets in the divider... it allows you to store items to prevent them from getting tangled with the rest of your stuff. The entire divider is also removeable, which allows you to access the very back (or the bottom) of the luggage using the front access system. I always travel with my HEYS Packing Cubes. I've used them for years. They're a great way to organize your stuff and they also save you a bit of space. My favourite thing about them is that they can go straight from your luggage to a counter or a drawer. You don't have to go through the hassle of unpacking your clothes, you can just keep your stuff in the packing cubes for easy access. Buckling the two front clips on the side allows much easier access when the luggage is in the upright position. You don't have to worry about your things flopping out. The front access also houses a padded laptop sleeve that fits my 13" MacBook comfortably (it's actually sized to hold up to a 15" laptop). What I love about the front access is that you don't need to lay the luggage flat in order to get something out. If you put the items you're likely to need during your flight in the front, you can always them access easily. They also come with a 3-dial combination lock for the front access zipper. I love that it's a combination lock because I always worry about loosing keys to travel locks. 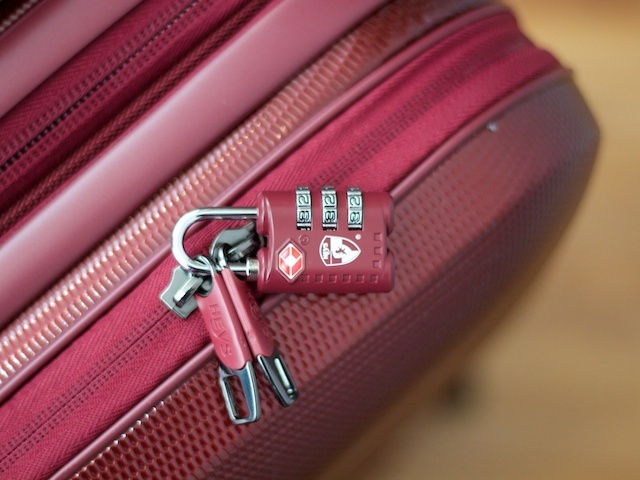 Plus the TSA feature allows Security to easily unlock, inspect, and re-lock your luggage easily. It's disconcerting to think of someone going through your stuff without knowing but at least you don't have to worry about your lock being broken or cut. 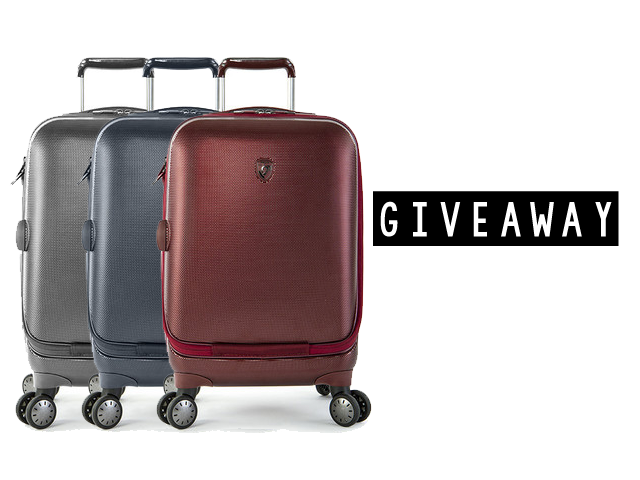 HEYS was nice enough to give away a Portal 21" SmartLuggage in your colour of choice (conditional on what's available at the time) to one of you. This giveaway is open to Canadian / US Residents only. Good luck if you're entering! 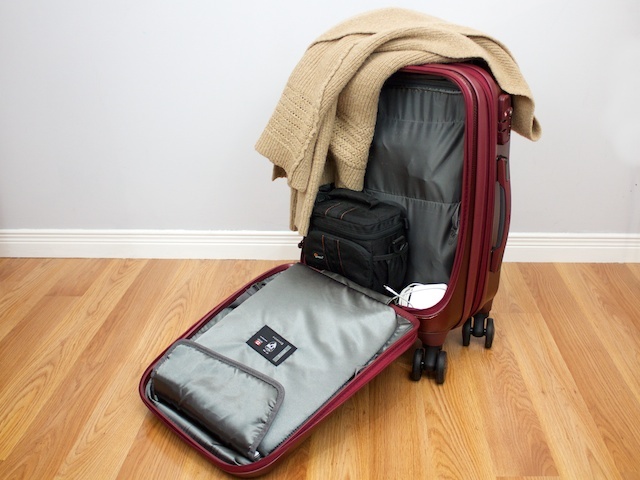 The HEYS Portal SmartLuggge comes in a three piece set. You can check them out on shop.heys.ca or heysamerica.com. Great review, Aleeza! I LOVE the burgundy colour too - plus it makes it easy to spot! I have been researching and hunting for a new set of luggage for Christmas and this set is exactly what I've been looking for! Ordered both of these pieces today and I'm super excited to try them out. Reading this review makes me feel like going away on a holiday now LOL! Love the front access feature of the carry-on - so much more convenient than lying the whole suitcase down and rooting around for what you need! 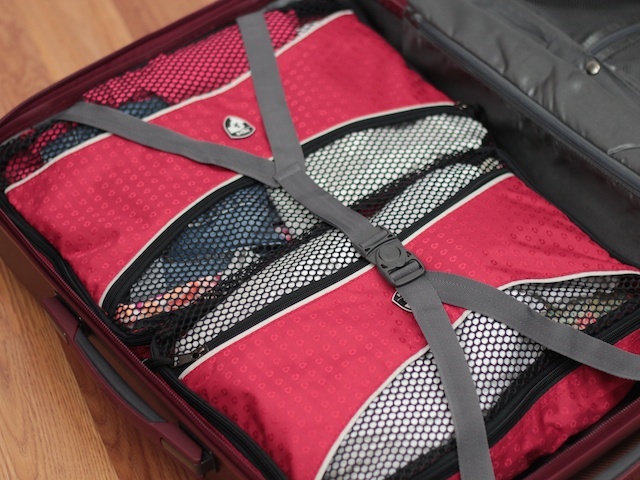 I've also never used packing cubes - but I think I'll need to look into those - they make everything so much neater. Thanks for the review. I've never owned a Heys luggage and have always wanted to try a hard-case too - this one looks especially well-made and nicely designed. Using a nice suitcase sort of completes the whole 'traveling attire'. :) Am hoping to try Heys in the near future. Awesome luggage! I've been traveling a lot for work (with some personal travel in there) lately and one of these would be really great! Who knew you could fit so much in a piece luggage that doesn't look that big? So great for weekend getaways! I love!